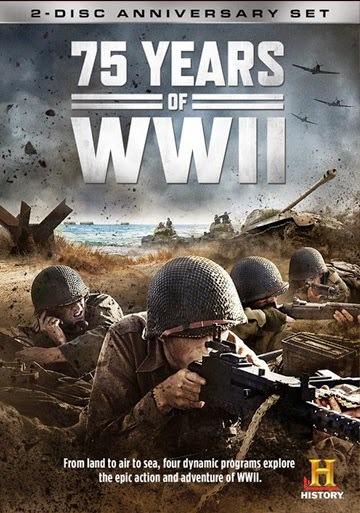 At the 75th anniversary of WWII, HISTORY® honors and remembers one of the greatest military conflicts in its new 2-disc DVD, 75 Years of WWII, which arrives on August 26th from Lionsgate Home Entertainment. Including a brand new mini-series, D-Day in HD, as well as three additional HISTORY® specials, the DVD provides rare footage, insights from experts and personal testimonies about the war that changed the shape of our world. The 75 Years of WWII DVD set comes with over five hours of content and will be available for the suggested retail price of $14.98. In this special collection, 75 Years of WWII, HISTORY® examines the deadliest conflict in human history. "D-Day in HD" presents the most critical military operation of WWII and the largest amphibious assault in history in newly transferred color HD. Through the personal accounts of soldiers on both sides, this special tells the story in the first person, in the words of those who lived it, from famous leaders like Eisenhower to unknown foot soldiers. "Bloody Santa Cruz" recounts the vicious combat in the South Pacific in which the USS Hornet was lost, while "Enterprise Versus Japan" takes us to November 1942, as the USS Enterprise sends the Japanese Imperial Navy to a watery grave. "Ultimate World War II Weapons" reveals the weapons and inventions that shaped and decided WWII, from the humble Studebaker truck to the shock and awe of the atomic bomb. History Channel always does a solid job on their documentaries, this one is no different... for all the war buffs out there.